Introduction: As sleeve gastrectomy becomes a more common bariatric operation, continued research is focused on creating better stapling devices based on a growing understanding of human stomach properties. Human cadaver stomach utilized for research purposes is often stored for varied periods of time prior to analysis potentially changing its structural properties. The purpose of this study is to determine how well human stomach maintains its tissue thickness after it is excised. This will dictate how quickly these specimens should be used for research experiments after excision before their structural properties disintegrate. Methods: We collected donated specimens from 50 patients undergoing sleeve gastrectomy and measured the tissue thickness over time. All data points were measured in the vertical midline of the specimen away from the staple line. 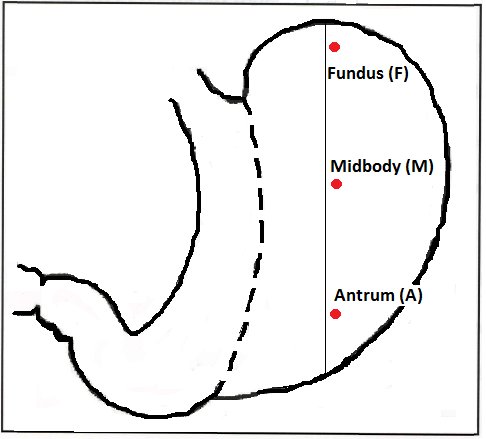 Three specified locations were chosen for measurement: antrum 3cm up from the greater curvature, midpoint of the body, and 1cm down from the fundus (Figure 1). A tissue thickness measuring device was utilized to acquire readings after a 15 second wait period at a tissue pressure of 8 g/mm2. Measurements were made at the time of excision, at 24 hours, and again at 48 hours post excision. The tissue was preserved in saline after initial data collection until study completion. Data was analyzed using a student’s t-test. Results: Tissue thickness decreased minimally at 24 hours post excision, but was significantly different at 48 hours losing approximately 10% of its starting thickness (Table 1). Conclusions: Excised human stomach specimens destined for experimental use should ideally be studied in the first 24 hours from excision to assure accurate tissue properties are maintained. After 48 hours post excision, the specimen begins to lose significant structural thickness.